Costa Rica - Pura Vida (Part II). Las Catalinas. Recently, my family visited Costa Rica. We split our time between La Fortuna, near the Arenal Volcano, and the Guanacaste region on the Pacific coast. I am excited to tell you guys about Las Catalinas Resort in the Guanacaste region of Costa Rica. Located on the pacific coast – a short 1.5-hour drive from the Liberia Airport – Las Catalinas offers something different from the other resorts in the area. Las Catalinas is a planned community – along the lines of Seaside and Watercolor in the Florida panhandle – offering luxurious villas and condos with the amenities offered by a 5-star resort. Most villas come with a house mom who provides housekeeping services, including laundry. In addition, the house mom will cook you a delicious breakfast to start your day and can make guacamole or smoothies for an afternoon snack. A convenient grocery stocking service will have your refrigerator (and bar!) stocked upon your arrival and they will check in daily to see if you need any additional groceries. At Las Catalinas, we stayed in Casa Indigo. 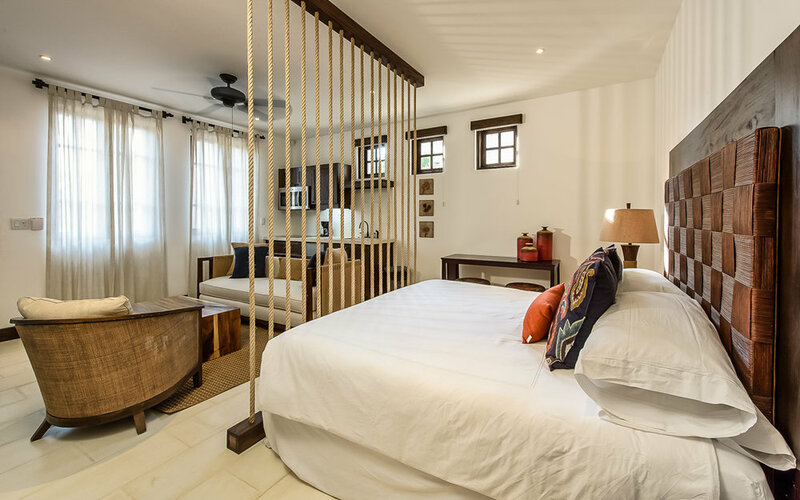 Available as a three or four bedroom villa, this spacious home also has an office, rooftop terrace with a bar (perfect for sunset cocktails), and a plunge pool. But there are many villas to choose from depending on the size of your party - and all are gorgeous and conveniently located. The black sand beach is a short walk from all of the villas. The beach is swimmable and you can enjoy snorkeling, boogie boarding, stand up paddle boarding and kayaking. Equipment is not provided but is available to rent. The Beach Club consists of three infinity pools: one adults only, one shallow for kids/wading and one suitable larger, deeper pool. The Beach Club grill serves delicious cocktails along with lunch and dinner options (I recommend the ceviche and the shrimp quesadillas!). The other restaurant on site is Limonada and is open for breakfast, lunch and dinner. Located on the beach it is an ideal location for a cocktail at sunset. If you are lucky, you may see a howler monkey or two! As hard as it is to imagine ever leaving this little slice of paradise, you would be doing your vacation a disservice if you stayed on property the whole time! Let the guest services manager arrange for you to go horse back riding, zip lining, snorkeling, fishing or wildlife viewing – to name a few of the options.